With the Liberals stuck in rebuilding-mode, the NDP took the lead in many surveys throughout 2012. But with the election of Justin Trudeau as the new Liberal leader in early 2013, the NDP’s support tanked — to just barely above 20% in many polls. That’s essentially where Mulcair’s NDP remained for the rest of 2013, 2014 and early 2015. Everyone expected Trudeau, the son of the (mostly) beloved former Liberal premier Pierre Trudeau, to claim the Liberal leadership — even before the extent of Ignatieff’s horrific 2011 result became clear. Like Trudeau, Mulcair is a Quebecker with his sights firmly on the political center. Back in 2012, everyone thought Mulcair would have an easier time holding the NDP’s support in Québec against Trudeau. That’s proving true — Québec is the one place where the NDP has retained strong support. Certainly, Notley’s election in Alberta encouraged voters to give Mulcair’s party a second look. But that’s not the only factor powering the current NDP wave. 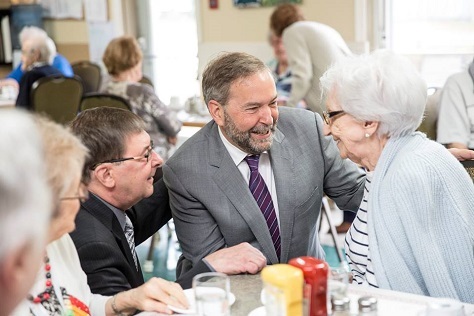 After nearly a decade of Tory rule, there’s every reason to believe that the natural pendulum of politics will swing left in the 2015 election, and Mulcair has long positioned the NDP to win Harper-weary swing voters. Moreover, the early rapture that greeted Trudeau’s first year as Liberal leader has subsided, and Harper has reinforced the idea that Trudeau, despite his pedigree, is a political dilettante light on cunning and even lighter on policy proposals. Most recently, progressive voters despaired at Trudeau’s decision to back the government’s anti-terror Bill C-51, which vastly expands the powers of the Canadian Security Intelligence Services. None of this means that Mulcair will easily become Canada’s next prime minister. There’s a risk that the NDP is peaking far too early, and that long-time Liberal voters flirting with Mulcair in the summertime will come back to Trudeau by autumn. As the campaign begins in earnest, Harper and Trudeau will almost certainly unleash their political fire on Mulcair — and there are signs that may already be underway. Maclean’s ran a piece late last month suggesting Mulcair almost joined the Tories in 2006, conducting secret talks to join Harper’s government as an environmental adviser. Though Mulcair has taken pains to leave behind his reputation as ‘Angry Tom,’ murmurs about temperament are certain to bubble into the debate. Moreover, the return of the popular Gilles Duceppe as the leader of the Bloq québécois will almost certainly make the BQ a more popular option than under the leadership of the hardline Mario Beaulieu, forcing Mulcair to spend more time and money that he might have once deployed to the all-important Ontario battleground. Though Mulcair would like to introduce greater spending on health care, raise the federal minimum wage and raise corporation taxes, he has emphasized tax breaks for small business and otherwise tried to reassure the business community that an NDP government wouldn’t choke investment or depart from the fiscal discipline that’s marked Canadian policy since the Jean Chrétien era of the 1990s. The revelation that Mulcair once considered joining Harper’s government could actually help him convince voters that he wouldn’t pull Canada’s government too far to the left. In reality, however, a Mulcair government would need to find support from one of the other two parties, making a socialist lurch difficult. If the NDP controls the next government and overreaches on policy matters, the Conservatives and Liberals could easily team up to thwart Mulcair. The Liberals, especially, may be particularly disagreeable. Having anointed Trudeau as its savior in 2013, the Liberals enjoyed a double-digit lead as recently as late 2014. So if it’s pushed to third place again in 2015, the Liberals, the dominant party of Canadian government throughout the 20th century, will face tough questions about their continued relevance. Since prime minister Paul Martin’s loss in the 2006 elections, the party cycled through a series of leaders, including Stéphane Dion, Ignatieff and Bob Rae (who served as interim leader for nearly two years), before turning to Trudeau. If Trudeau fails, it’s hard to be optimistic about the party’s future. There will be talk about a potential coalition with the NDP, but both the NDP and the Liberals have resisted the idea for decades. (Then again, the Progressive Conservative Party rejected a merger with the Canadian Alliance/Reform Party for a decade — up until very nearly the moment it embraced it). There’s an equal chance that an NDP victory could draw even more loathing between Canada’s two left-leaning parties, given their very different origins. The NDP has long been a fixture as Canada’s third party of the progressive left. Its predecessor, the Co-operative Commonwealth Federation (CCF), was founded in 1932 as an anti-capitalist response to the Great Depression. Its roots, however, were firmly established in the populist and progressive movements, popular among farmers, that also swept the upper interior and the prairie west of the United States. Its modest success in the 1940s, including Tommy Douglas’s election as premier of Saskatchewan in 1944, pressured the ruling Liberal Party to introduce universal health care nationwide. The CCF transformed into a federal party in 1961, what we know today as the NDP, with Douglas as its initial leader. For the next 50 years, the party was a constant presence in Canadian politics, typically winning anywhere from 17 to 40 seats from election to election in the House of Commons — until, of course, the 2011 election when the NDP emerged as the official opposition. Mulcair is a federalist, and his election would, in some ways, be a throwback to the days of the late 20th century when Canadians seemingly chose an endless stream of talented Montréal politicians as prime minister — the elder Trudeau in the 1960s and 1970s, the conservative Brian Mulroney in the 1980s, then Chrétien and Martin in the 1990s and early 2000s. If he convinces Canadian voters that he is the steadier and more experienced alternative to a fourth Harper term, Mulcair would fit nicely into a long-established pattern of federal governance. Previous PostA Twitterstorm on the political fallout from the Greek dealNext PostBruguera heading from Havana to New York?